Welcome back to my Mother’s Day extravaganza!! Today I am counting down 10 of the ways that my mom has been a rock star throughout my life. This is SO not comprehensive and I am sure I could think of hundreds more. TOP TEN THINGS MY MOM ROCK(s)ED AT!! 10. Cookies and support. For the past three years I have been taking kids to Washington DC in June. Starting in September before we leave we work until April to fundraise. From the beginning my mom (and dad the first year) brought cars to be washed knowing that they wouldn’t come close to being as clean as a professional would get them and knowing that they were going to give us way more money than a professional would charge. She made cookies for the kids. She stood on a street corner holding a Car wash sign. She sat at a garage sale with five women who didn’t speak a word of English so that I could take a little break. But that’s who she is. She supports Teresa and I in whatever we are trying to do. 9. VBS. I can’t remember a time in my life when, during the summer, my mom wasn’t involved in some kind of Vacation Bible School program. From birth to college she and my dad were basically the ones running the show. We would travel around to churches all over the north east and in Texas and Teresa and I would help set up. We would play the shooting gallery game and lose rubber bands. We poured glue into old flim containers and put Q-tips out for the kids to use. Since we usually attended the VBS at our own church in PA, during other VBSs we helped in whatever way we could. Mom had a way of reaching those 1st through 3rd graders. It was the way she spoke to them, the way she related to them, the way she prayed for them. I had no idea what VBS looked like without my parents running the show for a VERY long time. Even now, at 73 she is still involved every summer in VBS. 8. Her Patience. It is safe to say that I am blessed with my father’s Irish temper. I can go from 0-60 in no time flat. Mom on the other hand can keep her cool in the hottest of situations. I can guarantee you that I was not a docile child. When I was little I thought the Golden Rule was “Don’t run in the church house!” because I heard it so much. Mom somehow managed to keep up with me. She recognized my need for constructive activities and taught me letters and numbers. I was ready for Kindergarten at 4, and she made phone call after phone call until she found a school that would take me a year early. As it turned out, the school that accepted me also informed my mom that this new fangled thing called Pre-Kindergarten was starting at another local Christian school. So in the end I stayed with my own age group. But that didn’t change the fact that my mom worked tirelessly to find the best situation for me. 7.Pioneer Girls. Much like VBS, my mom was involved in Pioneer Girls at Spring Branch/BridgePoint almost from day 1 of living here. Long into her late 60’s (and possibly into her very early 70’s) she took the girls roller skating (and skated with them!!!) and to overnight camp. She always came home tired and sore, but it never dissuaded her from doing it the following year. She loved those girls so much! I should also note that she and I STILL have hand stand contests in the pool throughout the summer. And she is GOOD!! 6. The Award-winning Halloween costumes. I’ve mentioned my mom’s sewing skills before. She was quite handy with her Singer sewing machine. She made clothes for me and Teresa, she made clothes for our dolls (including Barbies). She even made a few outfits for the dog. But the best things she ever made were our Halloween costumes in 1984. I won Most Original in a contest and got to be in the paper. Teresa won wearing the same outfit 3 years later. 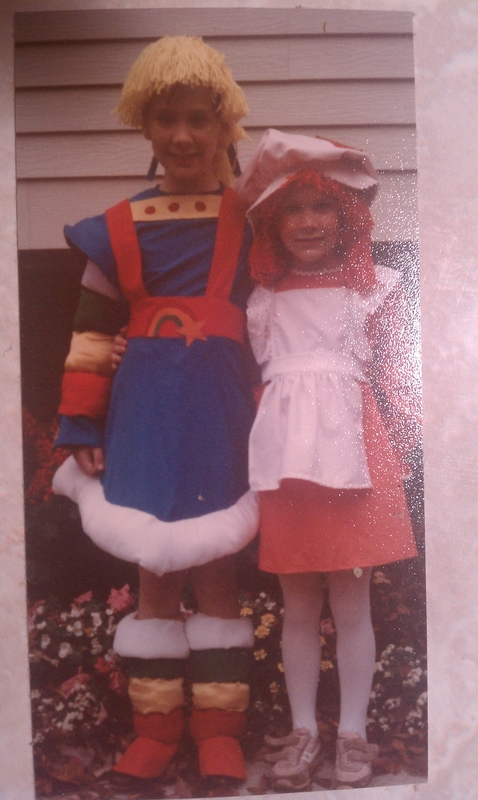 I was Rainbow Brite and Teresa was Strawberry Shortcake. Seriously…. check out those boot covers!!!! 5. The car bed. I meant to find a picture of this when I was getting the others, but I forgot. I hope I can explain it well enough. Ok, you know that we traveled a lot. Like, A WHOLE LOT when we were growing up. As in, at least 800 miles in the car every single summer. 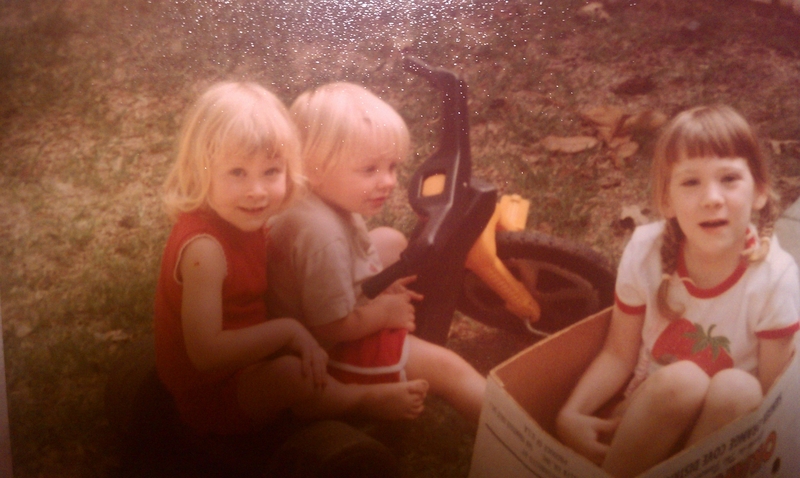 When I was about 4 or 5 my parents invented the car bed. Now, obviously this was before seatbelt and car seat laws. I mean, for crying out loud, I spent most of my 2nd year standing in a play pen in the back of our International Harvester Travellaw (an old school Suburban). Anyway, since we travelled so much my dad built this wooden frame that sat on the car seats and had legs that went into the back seat wells. Then my mom made 2 cushions, kind of like couch cushions, about 3 inches think that were covered in Raggedy Ann vinyl (oh, 1979 you are not missed!) and fit snugly onto the wooden frame and between the back seat and the back of the front seats. We used them until I couldn’t sit there without having to hunch. I was probably about 11. That led to one awkward summer when Teresa had her side of the car bed, but I had the regular car seat. Still, the ingenuity and skill when they put their heads together was pretty cool!! 4. Teresa’s twin. I had an imaginary twin brother off and on throughout my adolescence, but Teresa was the one who actually had a “twin brother”. Throughout our childhood mom was a willing daytime babysitter to several children whose parents both worked and day care was not a viable option. When Teresa was 2 my mom starting taking care of a little boy named Andrew who was just a year younger than her. They were inseparable and as you can see, they looked an awful lot alike. He and Teresa were best friends and got into all kinds of situations together. Later on, in PA mom took care of 5 kids whose mom had basically run out on them. She was in charge of an 18 month old, a 2 year old and a 3 year old all day long; a 5 year old for half the day and a seven year old for a few hours after school. It was a job that started very early in the morning and ended late into the afternoon. But she knew that these kids needed help and she was available. She has never turned a blind eye to those who can use her assistance. She has befriended the unfriendly and cared for the ornery. She is a GREAT caretaker!! 3. The YMCA years. From the time I was 9-12 we spent a LOT of time at the YMCA taking various lessons. I took gymnastics and aerobics (don’t laugh, it was the 80’s. I was Dancing on the Ceiling with Lionel Richie). Teresa took ballet. We both took Swimming lessons. OH. MY. SOUL. The swimming lessons. We both knew how to swim, but these lessons taught us new strokes and new skills. But the process…. First of all, I don’t think our lessons were at the same time. So mom had to sit there and watch us through the ginormous picture window fromt he lobby to the indoor pool for like 2 hours. Then came the aftermath. Because it was winter we weren’t allowed to go out with wet hair. So we had to take showers, wash and condition our hair, put on clean clothes and blow dry the hair. I distinctly remember once Teresa had pigtails and didn’t take them out before trying to wash her hair. It was not cute. So we would leave right after school and wouldn’t get home until like 6:30 or something. And then, mom had to make dinner because we were not wealthy and didn’t eat out like that. And that was just stuff and the Y. We also had piano lessons (x2), Wednesday night church…. the list of chauffer duties is kind of endless. But she did it because she wanted us to be well-rounded. When I was in 8th grade we were moving from one school district to another. The problem was that we had to be out of our house 4 months before we could get into the new house. PA did not have the transfer rules that TX does, so we had to find a rental in my current district so I could finish middle school in the same place. The bus I had to take was horrid. They were cruel to me and I hated it so much I usually came home crying or trying to hide my tears. So my sweet mom would so often pick me up from school so that I didn’t have to live with that. It wasn’t easy with Teresa’s schedule being different, but she knew how much it meant to me! 2. Like a rock. It may surprise some of you not to find this in the number one spot… Bear with me. When my dad died I thought I had to the strong one. I thought for sure that my mom would NEED me to be the strong one. She had just lost her husband. In fact, she had just lost him (in part) to kidney failure, which is what her first husband died of almost 50 years earlier. Those who don’t know my mom well see a sweet little grandma sort; easily upset. She’s SO not. I know that she has been sad over the past 17 months, but she is so strong. One of the facts that makes her strong is her faith in the Lord and the fact that my dad is strong and healthy and (probably) loud as all get out in Heaven. And we will all be reunited one day. Her faith is like a rock. Not easily moved. A devastating blow like losing her husband somewhat unexpectedly couldn’t knock it loose. She is an indescribable, unbelievable example of faith to Teresa and I. 1. Lullabies. Hymns. I have an insanely active imagination. It’s what makes me a good writer. But when I was a kid it was also what gave me bad dreams at night. I would run into my mom and dad’s room and shake my mom awake who without hesitiation would come to my room and sing me to sleep. Except she didn’t sing lullabies. She sang hymns. She sang Trust and obey. She sang God will Take Care of You. She sang The Old Rugged Cross. She sang Amazing Grace. She sang At Calvary. She sang Great is Thy Faithfulness. She prayed in between songs that Jesus would comfort my heart and help me sleep. I am so glad that I have the memory that I do. I am so glad that I can remember those things. I had no idea what I was blessed with back then and I am so glad for the hindsight to see it now!!! Your mom sounds amazing! That costume was fantastic. I loved Rainbow Bright!! She’s an amazing woman-a great example for all of us.